Ever wonder why your kitty kneads you with her paws, or lands perfectly on her feet after every jump? 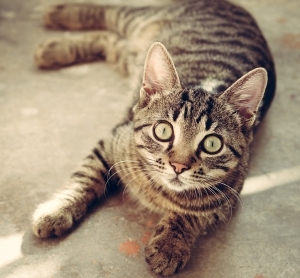 Test your cat knowledge with the answers below — we think even the experts will learn something! If you find yourself with a snuggly cat nestling up to your lap, you may also find yourself being kneaded like a loaf of bread. This endearing instinct, also known as “happy toes,” starts young, and has to do with nursing — a kitten kneads her mother to stimulate milk production. The rhythmic motion is done with alternating paws, and while it may sound odd, take it as a compliment; this is pure cat affection! “Its not just because they’re happy,” claims this Wired article: http://www.wired.com/2015/05/why-do-cats-purr/. Although the exact reasons are still somewhat of a mystery (after all, we can’t ask cats ourselves), taxonomists are pretty certain that purring offers self-soothing for felines during times of stress, but also during times of leisure and relaxation. A cat will purr when it’s happy, hungry, stressed and content — in other words, it’s a tool for communication. One fact that may shock you: when domestic cats purr, they are promoting tissue regeneration, so in some ways, it is form of exercise! You may have noticed that cats loves cardboard boxes just about as as much as they love their owners — and the reason stems back to deeply ingrained predator and prey instincts. By having her own secluded space to hide, your furry friend is practicing to stalk, hide, and hunt — all in the safety and security of a box. It may sound silly to us, but to our cats, it goes beyond a fun game of hide and seek; studies have shown that cats with access to a box experience reduced levels of stress. Have a cat with a funny quirk? Please share in the comments, we’d love to hear!